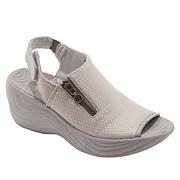 Make every day dashing with an airy slingback sandal featuring a combination of tonal patterned fabric and satiny trim. 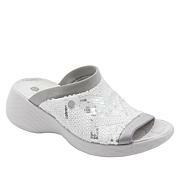 Built on a low wedge for a little lift and boasting Bzees Cloud Technology, this versatile sandal gets to the heart of what matters most in shoes — comfort — without sacrificing style. Like them but the size I tried was too big. See above. But they were cute and a good value. A great sandal. I bought at end of summer. On my feet all day, nothing but comfort with these sandals. Kind of boxy looking but no matter, the comfort is there. Very pretty materials used on the top. Nice elastic around heel. Holds it shape. I recommend. True to size. Glad I purchased these shoes! I really like the red color and the touch of the soft fabric at the front toe opening. Very comfortable and a good heel height for me. Even casual days can be glamorous when you wear these high-fashion loafers. Feminine embroidery gives the classic slip-on design a fashionable edge. With a flexible, lightweight rubber sole and aerated, foam-padded insole, you'll make going to the grocery store a stylishly comfortable event.